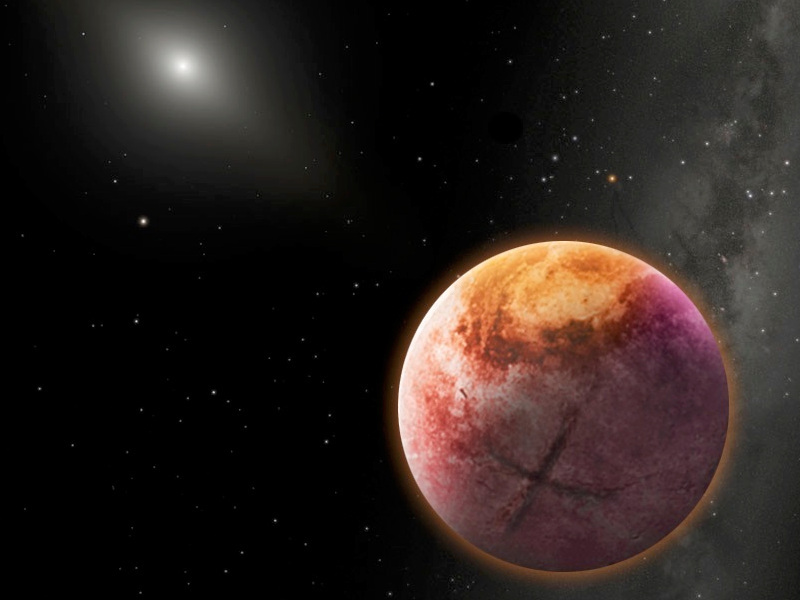 An artist’s conception of Planet X. Illustration credit: Robin Dienel. 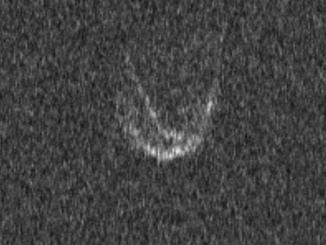 In 2014, Sheppard and Trujillo announced the discovery of 2012 VP113 (nicknamed “Biden”), which has the most-distant known orbit in our solar system. At this time, Sheppard and Trujillo also noticed that the handful of known extreme trans-Neptunian objects all cluster with similar orbital angles. This lead them to predict that there is a planet at more than 200 times our distance from the Sun. Its mass, ranging in possibility from several times that of the Earth to a Neptune equivalent, is shepherding these smaller objects into similar types of orbits. 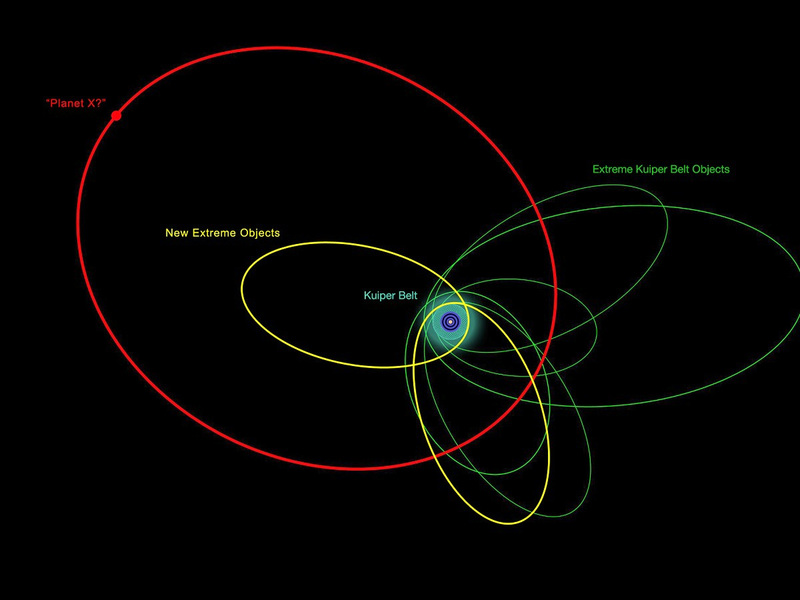 An illustration of the orbits of the new and previously known extremely distant solar system objects. 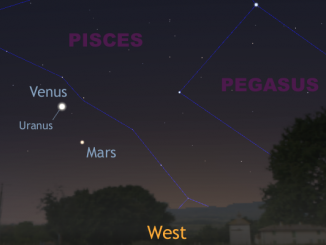 The clustering of most of their orbits indicates that they are likely be influenced by something massive and very distant, the proposed Planet X. Click the graphic for a larger-scale version. Image credit: Robin Dienel. Sheppard and Trujillo, along with David Tholen of the University of Hawaii, are conducting the largest, deepest survey for objects beyond Neptune and the Kuiper Belt and have covered nearly 10 percent of the sky to date using some of the largest and most advanced telescopes and cameras in the world, such as the Dark Energy Camera on the NOAO 4-metre Blanco telescope in Chile and the Japanese Hyper Suprime Camera on the 8-metre Subaru telescope in Hawaii. As they find and confirm extremely distant objects, they analyse whether their discoveries fit into the larger theories about how interactions with a massive distant planet could have shaped the outer solar system. Another discovery, 2014 FE72, is the first distant Oort Cloud object found with an orbit entirely beyond Neptune. It has an orbit that takes the object so far away from the Sun (some 3,000 times farther than Earth) that it is likely being influenced by forces of gravity from beyond our solar system, such as other stars and the galactic tide. It is the first object observed at such a large distance. 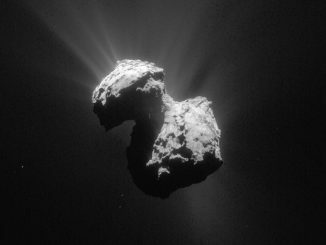 Canadian researchers have charted a path that most likely pinpoints the very origins of 67P/Churyumov-Gerasimenko, the comet studied intensively by ESA’s Rosetta spacecraft. Western University astronomers believe that 67P is made from primordial material and relatively new to the inner parts of our solar system, having only arrived about 10,000 years ago.